The Raumdeuter football position is something reserved for very special players. Those capable of playing in the position can do a variety of different things, and move around a variety of different positions. Very few are capable of performing this role, and the name comes from one very special player, someone who has been impressing in this role for a number of years. The player is Thomas Muller, who calls himself a Raumdeuter, and with the quality he has then I’m sure no one would argue with him. Muller won the World Cup with Germany in 2014 and as an individual won the Golden Boot in 2010, but there is a lot more to his game than just goal scoring. That is what makes Muller, and any other Raumdeuter a special and very prize possession. The meaning of Raumdeuter is simple ‘space investigator’ or ‘space interpreter’ and when you study how Muller plays the game, you will see that this description is the ideal fit for his game. Muller doesn’t go actively looking for the ball to impact a game, and he doesn’t simply wait for a goal scoring opportunity. Instead he looks for wide open spaces, putting himself in positions where he can do something with the ball should it eventually come to him. The Raumdeuter is all about being open and trying to read what will happen in the future. It takes a special player, a special mind and a very forward thinking person to be able to predict what will happen next in a game of football, and where the ball will go. Muller does this with perfection, and you only have to see the number of times he finds himself alone in space to see how well this works. Of course as an attacking player, one role Muller has is to score goals. He uses his vision and intelligence to carve out many opportunities. Often Muller is described as a player who pops up in the right place at the right time and that is certainly something that is no fluke. Anyone can do that on the odd occasion, but to do it time after time shows the signs of a very intelligent player. It is this that sets Muller apart from most other goal scorers, he isn’t naturally gifted, but his brain puts him in places that no other players will see and think about. There is no doubt that Muller plays the game with a huge amount of style and confidence, something that signifies his place as the ultimate Raumdeuter. 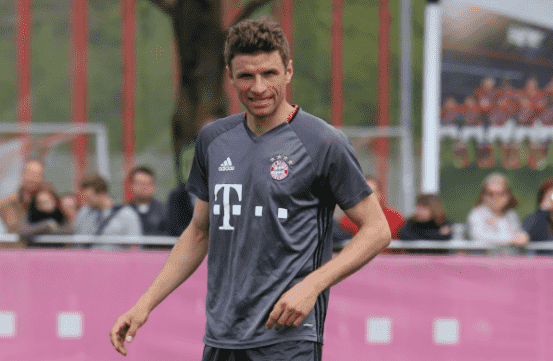 A lot of Muller’s play revolves around him reading the game and predicting what will happen next, and you have to be a confident player to play in that way. Muller says that this is something he was given as a gift, and not something that was coached into him. While many will try and replicate what Muller does on the pitch, it could be his gift that sets him apart from the pretenders to his crown.